The Kathleen & May is Britain’s last working three mast, wooden hull topsail schooner and the only one of her class still in operation. Built in North Wales at Connah’s Quay in 1900, she is one of the few remaining operational sailing vessels in the National Historic Ships Fleet, the sole survivor of shipbuilders Ferguson & Baird, and the last surviving Welsh-­‐built merchant sailing vessel. 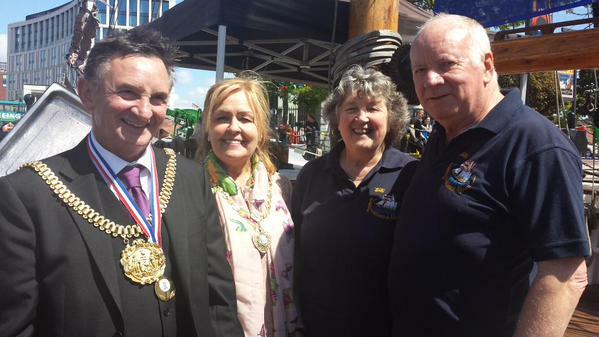 She was recently officially classified by the Arts Council as a National Treasure and at the Duke of Edinburgh’s behest, took part in the 2012 River Pageant to celebrate the Queen’s Jubilee. 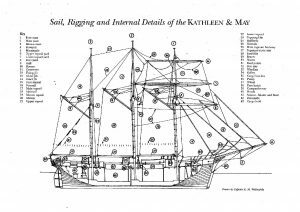 A trading schooner until 1961, the Kathleen & May is one of the few remaining links to the long-vanished trading fleets that used to sail Britain’s waters and were a way of life to entire communities, whose lives would have been goverened by the building, maintenance and sailing of these ships. 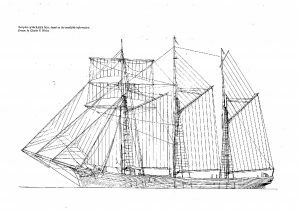 Her log books detail regular sailings around the British coastline, carrying a variety of cargoes between Liverpool, Cardiff, Ireland, the West Country, the Channel Islands, London and Scotland, sailing nearly 40,000 in her first eight years alone. During both world wars she continued to sail as a trading schooner carrying coal and other vital resources to small ports, and in World War II she was commanded by the Ministry of Defence to carry gunpowder with nothing but a gatling gun on her foredeck for protection. Today she is believed to be the largest merchant survivor from World War I still in sailing condition. Her importance to the national heritage was recognised by the BBC Home Service who dedicated a programme to her in 1956, and by HRH the Duke of Edinburgh and the late Duke of Westminster who established the Maritime Trust in 1969 to rescue her from demolition. Following the sad demise of this Trust, she fell into private ownership again when she was further restored, and in 2010 she came to officially reside her on Liverpool’s prestigious waterfront.